February 22 is a feast day in the Roman calendar. It is the feast of the "chair" of St. Peter, the sede in Latin, which we usually render as "the see" in our awkward ecclesiastical English. It celebrates this singular office in the Church which is the bishopric of Rome with all the universal significance it contains. It is a day to celebrate devotion to (i.e. love for) the office of the papacy, and confidence in how the Holy Spirit works through the flawed men who hold this office. I would also argue vigorously (and I don't think I'd be alone in this) that the men who have held the office during my lifetime (whatever their flaws) have been exceptional. February 22 is a time to remember and be grateful for these exceptional men. In the year 2005, however, February 22 gained a new significance for me personally, and quite possibly in the future for the whole Church (if she so judges it). This new event, however, has a profound and fitting relationship to the present significance of the day. Msgr. 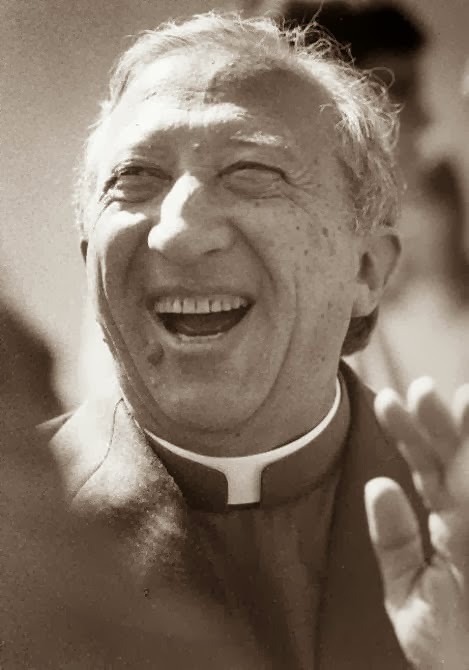 Luigi Giussani died on February 22, 2005, several weeks before his friend Pope John Paul II. It is well known that he lived a profound and exemplary affection for the popes of his time. He was also a witness who touched the hearts and the understanding of these men, contributing to a distinctive point of focus in the New Evangelization. 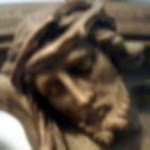 Giussani lived and expressed every day the fact that the presence of Christ is the definitive meaning of the whole of human existence, that the human heart's desire for truth, goodness, and beauty finds in the face of Christ the superabundant answer of Infinite Love, in a manner beyond all expectations. Jesus is the gift of God's love that, even as it transforms us by raising us up to a participation in the life of the Trinity, can also be recognized to correspond to the deepest needs of our humanity. Thus, for Giussani, what is decisive for Christianity is the encounter with the Person of Jesus Christ, who is present now in his Church. Christ is present in a way that provokes and challenges the human heart in every time and circumstance, and thus in our times, in our world, in all the environments in which humans search for meaning and fulfillment. 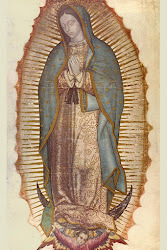 He is present through the whole mystery of the Church, from her teaching and her sacraments to the concrete gestures of caritas -- the love, understanding, compassion, and companionship -- that build up the relationships between human persons who have been touched by Jesus and who live his joy as a gratuitous proposal of friendship and solidarity with every person. Luigi Giussani has been a witness for many people in Italy, Europe, and throughout the world. There is much that needs to be said about this, but February 22 calls to mind the way in which his witness has touched in an intimate way the men who have been called to sit in the chair of St. Peter. Popes Paul VI, John Paul II, Benedict XVI, and Francis are among those who knew him. 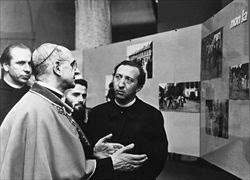 Paul VI knew him first, when he was Archbishop of Milan in the 1950s and Giussani was guiding the high school students participating in the episcopally sponsored Azione Cattolica. He encouraged him then, while admitting that he did not understand his methods. Later, in his final years as Pope, he met with Giussani again, and this time he spoke without qualification, saying to him, "This is the path. 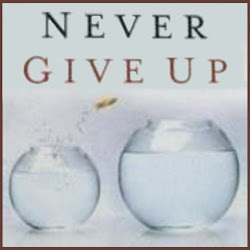 Go forward on it." 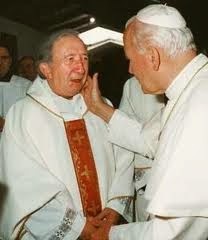 John Paul II recognized immediately the congeniality of the movement that took inspiration from Giussani, that had come to be known as "Communion and Liberation." In a meeting in 1982, he charged them specifically to "go into all the world to bring the truth, beauty, and peace that are found in Christ the Redeemer... Take onto yourselves this need of the Church: this is the task that I leave with you today." As CL expanded into a worldwide ecclesial movement, the priest who had begun as a teacher in a high school classroom, who said that he had never intended to "found" anything, relied much on the guidance and wisdom of one of the most important members of John Paul II's curia: a man named Cardinal Joseph Ratzinger. The great heart of this much misunderstood and under appreciated man grew deeply from this relationship. Ratzinger said at one point that Luigi Giussani had "changed my life." 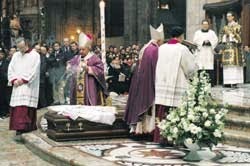 When Giussani died in 2005 after a long illness, Cardinal Ratzinger -- who seldom preached in public -- personally requested to represent the ailing John Paul II and celebrate the funeral Mass in Milan, where he would preach before thousands in attendance and all of Italy through natioinal television coverage. People (and churchmen too) heard for the first time the clear, simple, and tender eloquence of the Cardinal whom they had seen primarily as the Pope's "enforcer." The memorable "funeral oration" of February 24, 2005 was the voice of Cardinal Ratzinger speaking of the witness of faith given to him by his friend. In less than two months, he was elected Pope Benedict XVI. For his personal household staff, Benedict chose consecrated women from the CL association Memores Domini. 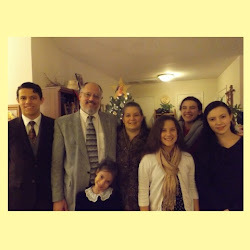 Each week the household held the common reading and meditation, the "School of Community," that challenges those who attend to make a comparison between the proposal of Jesus Christ and their own experience of life. These meetings are held all over the world today, and everyone is welcome regardless of their beliefs or lack of beliefs; they are welcome to come as much as their freedom prompts them. Of course, the School of Community in the Papal household was private, but there was one very conspicuous and faithful participant: Pope Benedict himself. Benedict's staff has accompanied him in his retirement at the Mater Ecclesiae Monastery (they are the "four consecrated women" who are sometimes mentioned as his attendants). Undoubtedly, they continue their small School of Community, and the Pope Emeritus continues to be helped by it to seek the presence of Christ in the unique circumstances of these moments in his life. 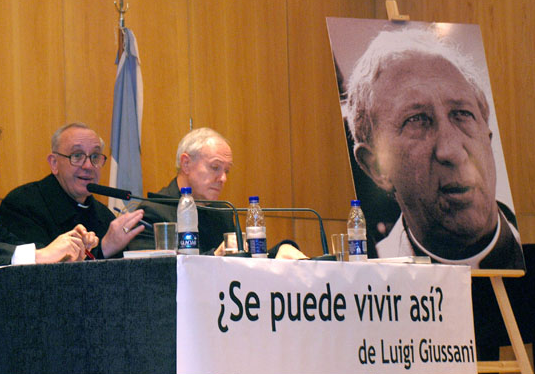 Meanwhile, in Buenos Aires, Cardinal Jorge Bergoglio was reading the works of Giussani, and gave public introductions to the first Spanish editions on two occasions. He said that he had made a point of reading Fr. Giussani's writings because they helped him "to become a better man and a better priest." Cardinal Bergoglio also became good friends with the priest who helped guide the CL group in Buenos Aires, Fr. Giacomo Tantardini (who was very personally close to Fr. Giussani). Pope Francis has an affection for many of the new ecclesial movements (as did Benedict and John Paul II). He speaks the language of the new evangelization: the need for personal witness, for bringing the faith into the places where real human life is lived, for building a "Culture of Encounter." If we think the word "encounter" is vague and mushy, Giussani can help us to see its authentic and profound ecclesial and human significance. But there is nothing particularly "Giussanian" about any of Luigi Giussani's teaching, other than the charism of his particular focus, as well as the impassioned and sometimes difficult style of his words. Giussani only wanted to articulate the reality of Jesus in the Church as he had experienced it in its Catholic fullness. 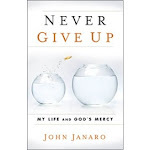 Giussani's challenge to popes and to everyone was to live the intensity of belonging to Christ in every circumstance, to allow Christ's grace to convince us and change us, and to find the joy of Christ in wherever we are and in whatever we do. And let us not be afraid to let others see this joy and be drawn by it. The Servant of God Msgr. 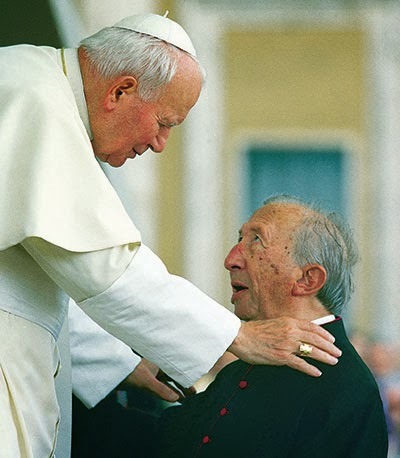 Luigi Giussani was the friend of popes and of humanity. He was, as John Paul II called him, a "teacher of humanity." He was a prophet and a pioneer in the New Evangelization.